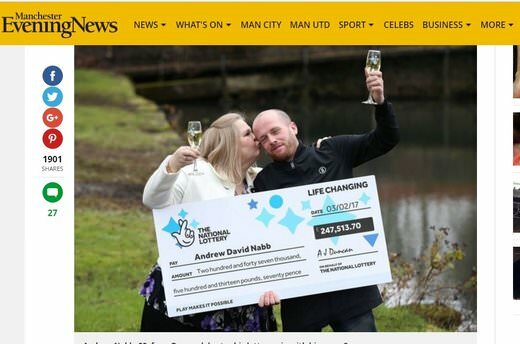 Single dad Andrew Nabb, who has been in and out of work for the past 12 months, bought a lucky dip EuroMillions ticket from a local shop and promptly forgot about it. But he received very good news when he remembered the ticket and had it checked. The steel fitter was at a local store when he thought of having his ticket checked. He gave it to the lady there, and then the machine made funny noises while checking his ticket. The lady then told him to call Camelot, which everyone knows means only one thing – a big payout. Nabb hurriedly went back home, called Camelot, and received what he describes as the best news he has ever received after his children were born. He later turned up at the lottery offices with his mum to claim a £247,513 prize. The winner now says he wants to get driving lessons, buy an Audi A3, and go on a vacation to Tenerife with 2 sons and a daughter. He says he will continue playing.